Innovative and unique training for those who work with people who hear voices. Designed by people who hear voices and people who work with people who hear voices, learning from both experiences. If in your work you encounter people who hear voices – and who might be struggling with the experience – then this workshop is designed for you. More than 200 workers from from more than 20 agencies across Ontario have now attended our foundational workshop for those who, in their work, encounter people who hear voices, see visions or have other experiences that can be difficult. find common ground between your own experiences and the kind of extreme states that others may experience. offer a one-person safe-space for people to talk about their difficult experiences. emancipate yourself: even in a system that puts pressure on you to be otherwise you can be a human being first- even at work. This workshop is designed to leave you feeling more competent and more confident to work one-to-one with people who hear voices and struggle with their experiences, and will also enable you to connect with a community of folks who are doing similar. Understand hearing voices [and other experiences] as a normal human experience, maybe not one shared by everyone, but part of the variation and diversity of what it means to be human. See through and beyond diagnostic frameworks and resist the urge to catalogue and categorize everything as “symptom”. If, in your work, you come into contact with people who hear voices and who struggle; and you have experienced how that can leave you feeling uncomfortable or worse, then we think you’ll find this one day workshop useful. 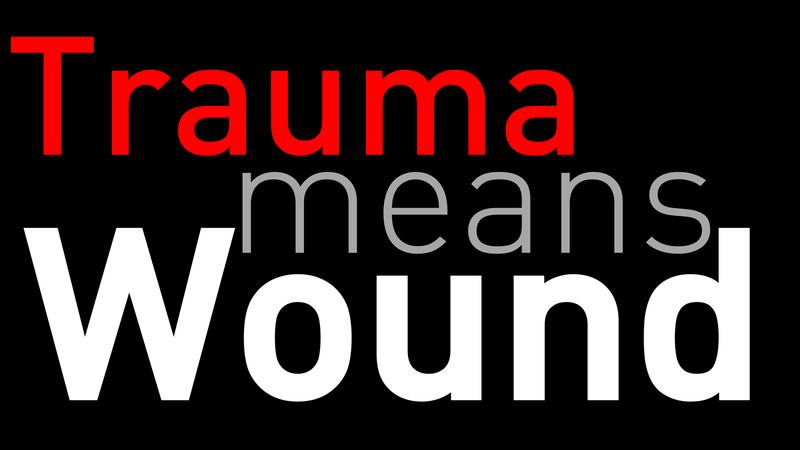 So, if you’re a doctor, nurse, social worker, community worker, housing worker, peer support worker, psychologist, therapist, police officer, etc. then it may be for you. Learn how we can think differently about voices. This workshop is designed to leave you feeling more competent and confident in your own ability to work one-to-one with people who hear voices. You will not become an expert in one day but you’ll have a good basis for starting and feeling more comfortable as you do.Participants in this workshop will be also invited to join our ongoing learning community. The workshop is designed and led by Kevin Healey and Marc Roininen. 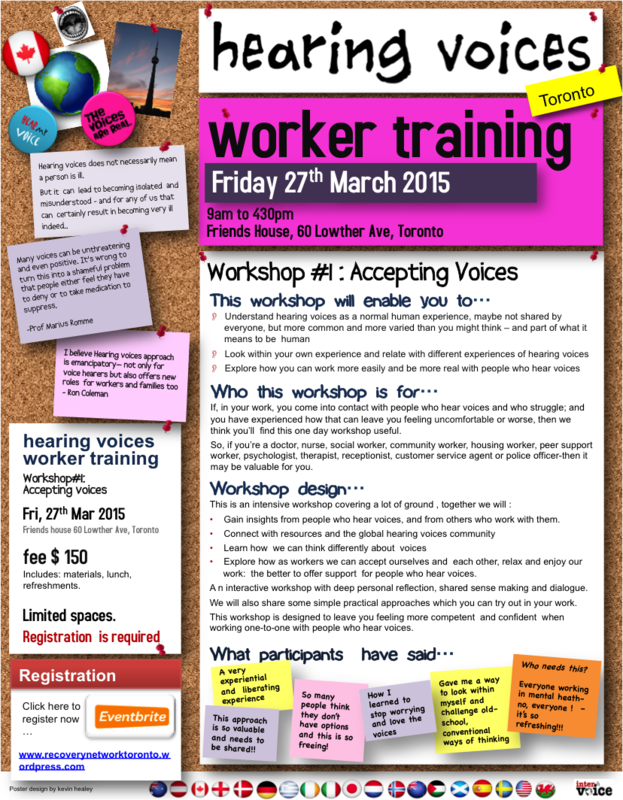 Already attended our Accepting Voices Workshop? Introductory, or foundational, module designed to help you to understand a range of experiences including angry and critical voices, strange visions, to connect on a human level and have confidence in your own ability to work with people who hear voices.Workshop#1 is a basic introduction and also the foundation for continuing with Workshops #2 and #3. Solid introduction to voice profiling, Maastricht Interview, voice mapping and voice dialogue – key approaches and tools for working one to one with a person who hears voices. Includes opportunity to practice. A two-day, intensive, small group workshop offering an intro to key approaches and with time to begin practicing. Note You will need to have attended Workshop #1 in order to attend Workshop#2. Workshop #2 – Dates: Thu 17th, Fri 18th March 2016. Is your organization or agency ready to host a Voices-Safe Space? 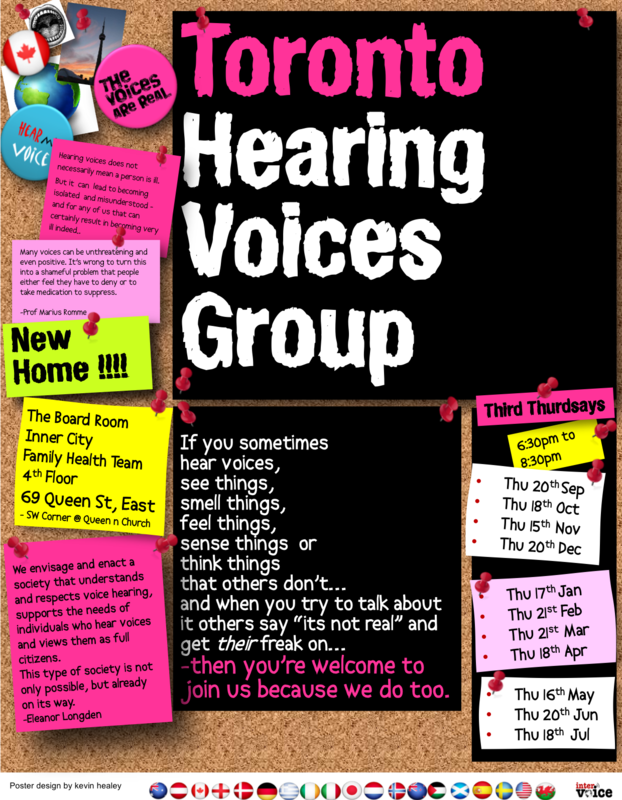 What a hearing voices group is, isn’t, and can be. The HV groups charter, different types of groups, who decides? Starting is easy, what about Sustaining? HV Group facilitator role, skills, toolkit and opportunity to practice. 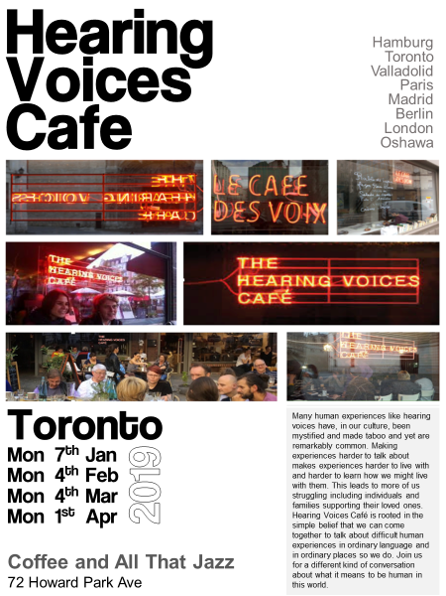 This entry was posted in Crazy World, Event and tagged hearing voices, Toronto, Training, workshop. Bookmark the permalink.